We here at East Side Games was touched by Keith “Aieron” Knight‘s story of going to fulfill his dream in watching the League of Legend’s (LoL) World Championship in person. Keith has muscular dystrophy, but rather than letting that stop him, he’s an accomplished LoL player. He has raised awareness and funds for muscular dystrophy before and East Side Games is behind Aieron 100%! Aieron is currently raising funds for accommodations to the League of Legend’s World Championship. To support him, we are offering anyone a PAX ticket either for Friday or Saturday (August 30th – 31st) to those who donate at least 30 dollars for his cause! The tickets will be a first come first serve basis. 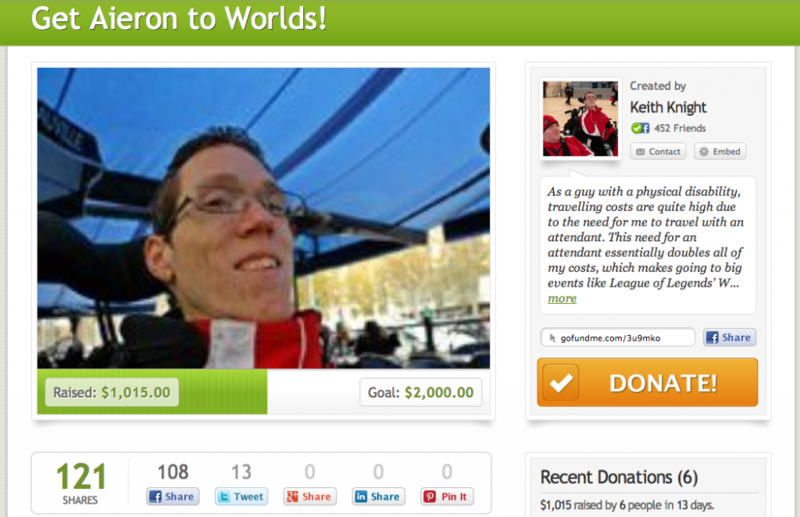 To support Aieron, visit his gofundme page! Check out Aieron’s amazing story here.